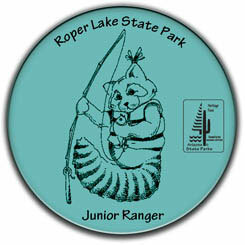 If you're between ages 6–12, you can become a Junior Ranger at Roper Lake State Park! Pledge to do your part to help preserve the beauty of the park for everyone to enjoy! 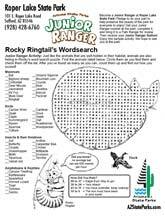 Rocky Ringtail's Wordsearch: Just like the animals that are well-hidden in their habitat, animals are also hiding in Rocky’s word search puzzle. Find the animals listed below. Circle them as you find them and check them off the list. After you’ve found as many as you can, count them up and find out how you scored! Show a kid a great time fishing, and you will have a fishing buddy for life! Roper Lake has various fishing opportunities available for children (and parents) that would like to try their hand at the local bass, trout, catfish, or bluegill populations. 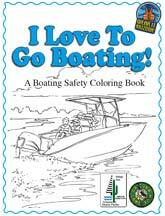 See this informative resource before your trip to ensure success at this beautiful southern Arizona fishing destination.